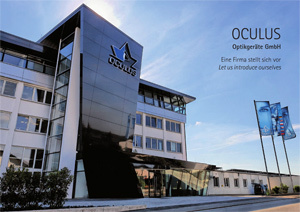 Our firm, OCULUS Optikgeräte GmbH, is active worldwide in the field of ophthalmic diagnostics. As you can see in this film clip, tradition and innovation are not mutually exclusive: This is the story of OCULUS from 1895 to today. Ophthalmologists, optometrists and opticians value the know-how we have acquired through 120 years of experience, as well as our innovative strength and our ongoing commitment to technological progress. Our success worldwide has not lowered our high standards one iota - we will always remain committed to producing the highest-quality, cutting-edge specialized ophthalmic equipment on the market. We invite you to see for yourself! For more than 120 years, OCULUS Optikgeräte GmbH has been a trusted partner for eye care professionals around the world. With the highest attention to detail, our devices are designed and manufactured at the OCULUS headquarters, located in Wetzlar, Germany. Thanks to our 10 subsidiaries in Europe, Asia and America, and more than 200 distributors in over 80 countries, OCULUS is accessible to all customers around the globe. More than 55% of OCULUS turnover is generated within the international market. There are about 380 employees working at the OCULUS headquarters – more than 60% of them in either research and development or production and service. OCULUS is DIN EN ISO 13485 MDSAP certified and applies high quality standards in development, production and service.